Greetings again from the darkness. It seems like many more than 8 years have passed since filmmaker Debra Granik’s outstanding film WINTER’S BONE exploded onto the indie scene and introduced most of us to Jennifer Lawrence (although she had been acting for 5 years prior). The talented Ms. Granik has chosen to adapt another book as her feature film follow-up, and once again nature and an independent spirit play a key role. Based on the novel “My Abandonment” by Peter Rock, it’s the story of a father and daughter who live off the grid … until society catches up to them. Ben Foster (always exceptional) plays Will, a war veteran and father to Tom, his teenage daughter played brilliantly by Thomasin McKenzie. The two live off the grid in the forests outside of Portland. 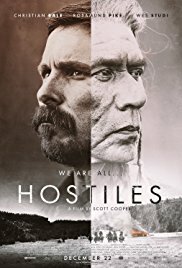 An extended opening sequence with very little dialogue shows us their daily life: capturing rain water, cutting trees for firewood, hiding their camp site, and drilling on making themselves ‘disappear’ in the foliage. It’s in these scenes where cinematographer Michael McDonough shines. His camera work allows us to feel as if we are in the damp forest as the sun rays peek through the trees. It’s a beautiful sight despite our uneasiness towards the father-daughter situation. 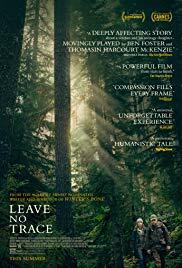 When Park Rangers discover them, the two enter the Social Services system, but rather than treat us to yet another uncaring and incompetent bureaucracy, director Granik allows human kindness and reasonableness to play its part. Will and Tom are moved onto a farm where she will enroll in school and he will work on a Christmas tree farm. Of course, we know that Will is not cut out for this life, though we begin to see Tom show signs of true independence and her own dreams. They make their way back into the woods and an injury – and more human kindness – has them end up in a camp with other outliers. The story really captures the conflict between a society that is obligated to educate and protect children, and the same society that has little clue how to assist veterans of war. We see folks who just want to be left alone, and others who maybe can’t fit in to society – or have no interest in trying. Supporting work is provided by Dana Millican, the great Dale Dickey, and Isiah Stone (one of the kids from WINTER’S BONE). There is a believability here rarely seen on the big screen, and the love between father and daughter is something to behold. Ms. Granik says so much by saying very little, but what could be such a bleak story actually revels in the kindness to fellow man – the type of kindness which seems all too rare these days. Greetings again from the darkness. The fallen king. The disgraced idol. We expect there to be more to the story of Lance Armstrong, but the bottom line is really pretty simple. Lance Armstrong is a liar. Lance Armstrong is a fraud. The movie offers little in the way of excuses or explanations, and you’ll likely think even less of Armstrong after the movie … if that’s even possible. 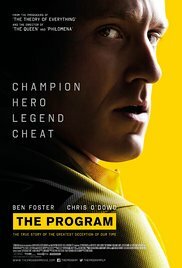 Ben Foster turns in a nice performance and is believable as Lance the cyclist, Lance the teammate, and Lance the doper. But even Foster can’t quite capture the public façade or reach the level of deception that the real life Lance maintained for years. Chris O’Dowd is spot on as David Walsh, the sportswriter who wrote the book on which the film is based, “Seven Deadly Sins: My Pursuit of Lance Armstrong”. In fact, the movie would likely have been more interesting had it focused on Walsh’s research and pursuit, rather than re-hashing the all too familiar Armstrong deceit. Director Stephen Frears (The Queen, High Fidelity, The Grifters) works with the screenplay from John Hodge (Trainspotting) and we see how Lance battled through testicular cancer and later sought out Dr. Ferrari (Guillaume Canet) – the Godfather of blood doping. We get many shots of the familiar yellow jersey during numerous Tour de France races, and we hear Lance pontificate on what sets him apart: desire, hunger, heart and soul, and guts. Later we hear his proclamation of innocence followed by “I’m the most tested athlete on the face of the planet”. Jesse Plemons (“Breaking Bad”, “Fargo”) has slimmed down and plays the crucial role of Floyd Landis – a devout Mennonite, Lance teammate, and the final straw in the crumbling of an empire. It’s Landis who broke “the silence around cycling”, and forced an industry and the public to accept what most of us hoped against all hope wasn’t true. Armstrong’s infamous “Oprah” appearance and public admission brought poignancy to his own words: “We are the authors of our life stories.” Perhaps this lesson is as valuable as all the money Livestrong raised for cancer research. Picturesque Hamilton Pool in Austin makes an appearance, as do songs from The Ramones, The Fall (“Mr. Pharmacist”) and Leonard Cohen. While the film is not at the level of Alex Gibney’s documentary The Armstrong Lie, it is a reminder that real life can be more dramatic and devastating than the movie version. Greetings again from the darkness. The U.S. Coast Guard has played a role in many movies over the years, but only a few have placed this service branch directly in the heart of the story … most recently The Guardian (2006), which was little more than a cheesy, too-talkative water-based rip-off of Top Gun. Director Craig Gillespie (Lars and the Real Girl, 2007) takes a much different approach as he presents a look at one of the most legendary and heroic real-life rescues in Coast Guard history. The Oscar-nominated writing team behind The Fighter (2010): Scott Silver, Paul Tamasy, and Eric Johnson have collaborated on the screenplay based on the book from Casey Sherman and Michael J Touglas. It’s a worthy tribute (and clearly Disney-influenced) to what is described as the greatest Coast Guard small-boat rescue. It combines a boat-load (sorry) of tension-filled ocean-based sequences with some pretty interesting character-based sub-plots within a Massachusetts community that has become all too familiar with storm-based catastrophes. Chris Pine stars as Bernie Webber, an awkwardly shy and obsessive rule-follower, who has lived under a cloud of doubt ever since a previous rescue mission failed, resulting in the death of a local fisherman/husband/father. We first meet Bernie as he bungles through a first date with Miriam (Holliday Grainger, a young Gretchen Mol lookalike). The film then jumps ahead to 1952 when they become engaged and Bernie is ordered into a questionable mission by his “not-from-around-here” commanding officer Daniel Cluff (Eric Bana). See, a huge storm has literally ripped apart not one, but two giant tankers, leaving crew members battling for survival. It should be noted that Bana the Australian, tosses out a laughable southern accent that is a joke within the movie and within the theatre (for different reasons). 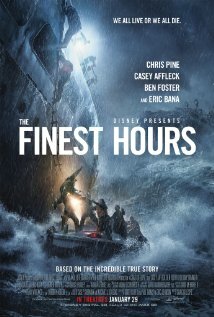 Bernie and his crew: Richard Livesay (Ben Foster), Andy Fitzgerald (Kyle Gallner), and Ervin Maske (John Magaro), take off against all odds in a too-small boat against too-big waves in a desperate attempt to rescue the tanker crew that includes brilliant engineer (and quiet leader) Ray Sybert (Casey Affleck) and characters played by John Ortiz and Graham McTavish. Affleck excels as what can be termed a quiet leader. Of course, we know how the story ends, but the heroic efforts against a very powerful Mother Nature show-of-force make for compelling movie watching. The special effects are stout, though not be as spectacular as The Perfect Storm (2010) or In the Heart of the Sea (2015), and it’s the human-factor that provides more than enough thrills, excitement, and tension. In fact, the biggest issue I had was that I saw a 3-D version which is an absolute disservice to the film. Most of the story takes place at night and at sea, so the 3-D consequence of dimmed light and muted colors results in a far too dark and dull look to the film. I spent much of the movie sliding the 3-D glasses down my nose in a simple attempt to enjoy a bit more brightness. The recommendation would be to skip the higher-priced (money grabbing) 3-D version and take in the more pleasing “standard” version. Disney makes feel-good movies. Their target market is not cynics or the overly critical among us. The romance pushes the “corny” meter, but keeps with tradition of other Disney movies based on true stories like The Rookie (2002) and Dreamer: Inspired by a True Story (2005). Keep this in mind you’ll likely find this one pretty entertaining. Stick around for the closing credits as a slew of real photographs from the actual 1952 event are displayed, as are photos of the real heroes from that night. Greetings again from the darkness. Finally catching up with this one after it received such critical raves on the festival circuit last year. It’s one of those films that cause so many “normal” movie goers to question the tastes of critics. It certainly has the look and feel of a terrific independent art-house film, but as they say, looks can be deceiving. The cast is outstanding and play off each other and the setting exceedingly well. 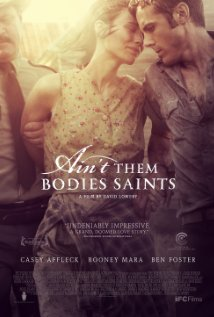 Casey Affleck, Rooney Mara, Ben Foster and Keith Carradine are a pleasure to watch … they make it easy to KNOW these characters. Daniel Hart’s score is the perfect balance of haunting and complimentary – understated at its best. The most exceptional thing of all is the cinematography of Bradford Young. The look of the film is right there with the best of Terrence Malick … and that amplifies the film’s biggest problem. The story is highly recollective of Malick’s Badlands, and that’s where the shortcomings jump out. There is just not much substance to this story – it’s really just another in the line of disillusioned criminals dreaming of a clean slate. 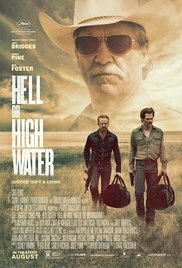 Writer/director David Lowery is a definite talent, but his dependency on look and feel prevent this one from reaching greatness. We recognize immediately that this can’t end well. The only question is how badly will it get for each of the main characters. Crime may not pay, but some criminals just seem to keep paying … and drag down others with them. For those that enjoy the indies, this is one to catch up with … and filmmaker David Lowery’s best work is still ahead of him. Greetings again from the darkness. This is one of those times where, in order to analyze a movie, one must separate from the emotion of the subject matter. In the traditional sense, this is not a great movie. However, in terms of practicality, the true story and characters and their actions, leave us emotionally exhausted and questioning whether any war actually makes sense. The other thing it does is bring to light just what impressive beings these brave soldiers really are. The story is taken from the book (co-written by Patrick Robinson) and real experience of Marcus Luttrell. A Texan and member of Navy SEAL Team 10, Luttrell was one of four chosen for the June 2005 Operation Red Wings … the capture or kill of al Qaeda bad guy Ahmad Shahd. Dropped into the Afghanistan Hindu Kush mountains, the mission goes horribly wrong once the group is stumbled upon by goat herders. The Rules of Engagement provide guidance that is supported by CNN concerns … and the decision is made to release them and call off the mission. To say all hell breaks loose after that is simply an understatement. The four SEALs face insurmountable odds that end according to the spoiler title. If you have seen Blackhawk Down or the opening sequence of Saving Private Ryan, then you have some idea of what to expect on screen as these elite soldiers fight for their lives and their country. The intensity and visceral violence is impossible to describe here. The bullets rip flesh and bone, while desperate re-grouping efforts lead to horrendous tumbles down rocky cliffs. The movie begins with a glimpse at SEAL training, followed by a few minutes of base life … the competitiveness, the bonding, the breeding of fighting machines. Director Peter Berg does allow for a peek at humanity and personality, but the Band of Brothers culture is unmistakable. When one of them states “moderation is for cowards“, we never doubt for a second that this is part of their psyche. 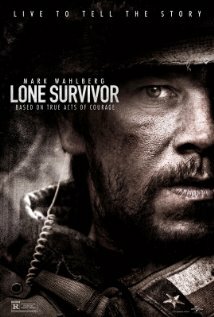 The four Seals are played by Mark Wahlberg (Marcus Luttrell), Taylor Kitsch (Michael Murphy), Emile Hirsch (Danny Dietz), and Ben Foster (Matt “Axe” Axelson). While they are all believable, this is not an actor’s seminar. Neither is it a geopolitical editorial. Partisanship is non-existent here. Rather, we are reminded of the sacrifice that comes with war, and left to decide for ourselves if this approach is the best we can do … but never having any doubt that these are heroes and extraordinary men. The real Marcus Luttrell makes an appearance in the movie … he is the SEAL that spills coffee and tells the rookie to clean it up. Finally, as director Berg was meeting with the families prior to filming, this quote came from Danny Dietz’s father after reading the obituary: “That’s who my son was. That’s how hard he fought. Make sure you get that right“.